The complex with a family feeling, has more than 250 bungalows. 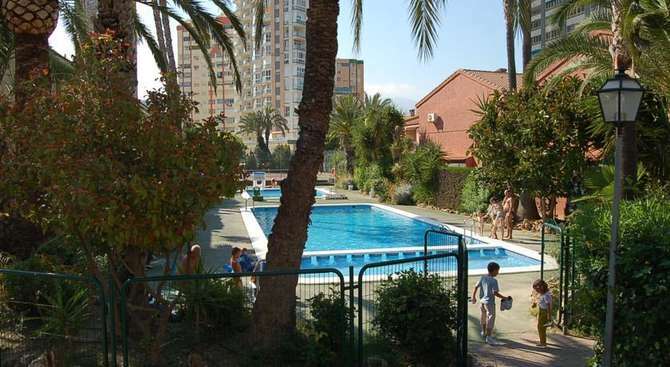 There are 3 swimming pools, tennis court (pay locally), garden, children’s park and play area. There is also a restaurant and shop for clients. The atmosphere of Rinconada Real which has some residential clients, is quiet and ideal for families. TV and safety deposit boxes can be rented. Air Conditioning is available only in the lounge with cost paid directly to the hotel / Apt. Rooms have fans. Bungalows have 2 bedrooms and can sleep up to 6 people. All are fully equipped and have kitchen with washing machine, bathroom and terrace. Each bungalow has a small garden and are ideal for families. Situated in Rincón de Loix, a residencial near Benidorm, and just 10 minutes walk from the Levante beach. The complex is surrounded by shops, bars, restaurants, pubs and nightlife. Nearby there is a small market on Wednesday. It is in easy reach of the theme parks of Benidorm, especially Aqualandia and Mudomar, which are just 10 – 15 minutes walk away. Small domestic animals are allowed - maximum 5 kg. on request with cost, paid direct to accommodation. Weekly change of towels and sheets. Cleaning for arrival only - not during stay.